Microsoft has always prioritized security over accessibility. AT times, we get errors while trying to log in to the system or accounts or a specific folder and face issues even though technically we have all rights to do so. However, the systems have been designed such that if there is any slightest possibility of a security breach, it locks the access instantly. The error occurs both with shared folders and local files. A known cause behind the issue is when multiple users are logged in to the system and one of them tries to update the version of the operating system. However, there could be other reasons as well. In case we are facing this issue with shared folders, our first approach should be to check the connectivity between the 2 systems. Even if they are visibly on the same network, the connectivity might be hindered due to many other reasons like Firewall. 1] Press Win + R to open the Run window and type the command cmd. Press Enter to open the Command Prompt window. 2] Type the command ipconfig and press Enter. 3] In the list of information displayed, check and note down the IPv4 address. Where <ip address> the one which we noted down earlier. 5] Press Enter to execute the command and it will help verify whether the 2 systems are connected or not. 1] Press Win + R to open the Run window and type the command control panel. Press Enter to open the Control Panel. 2] Select Window Defender Firewall from the list. 3] On the list on the left-hand side, click on Turn Windows Defender Firewall on or off. 4] Shift the radio button to Turn off Windows Defender Firewall (not recommended) for both Public and Private network settings. Other than the Firewall, the antivirus software could also be disabled temporarily. Once the connectivity issue is resolved, we could check for the permissions. 1] Right-click on the folder that is being shared (perhaps you might need to do it on the host system) and select Properties. 2] In the Sharing tab, click on Share. 3] Add, delete users and edit permissions as needed. 1] Press Win + R to open the Run window and type the command control panel. Hit Enter to open Control Panel. 2] In the Control Panel window, select Network and Sharing center. 3] From the list of the left-hand side, select Change advanced sharing settings. 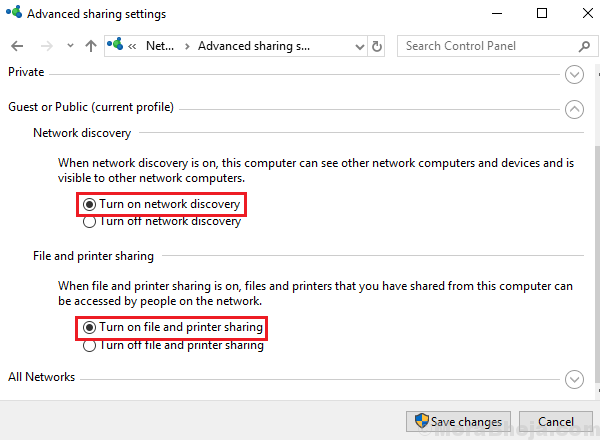 4] In the Network discovery section, select Turn ON network discovery. 5] In the File and printer sharing section, select Turn ON file and printer sharing. If the above mentioned 2 solutions don’t work, we could try deleting and re-adding the permissions.